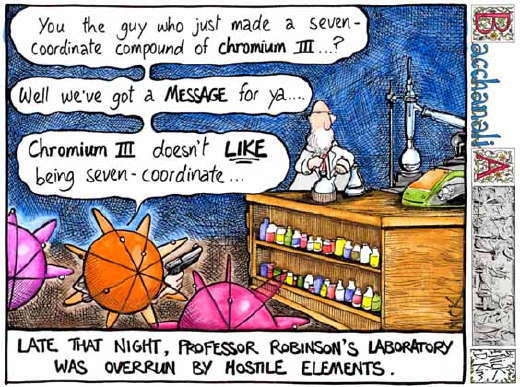 Chromium atoms have 24 electrons and the shell structure is 2.8.13.1. The ground state electronic configuration of neutral chromium is [Ar].3d5.4s1 and the term symbol of chromium is 7S3. Chromium: description Your user agent does not support the HTML5 Audio element. Chromium is steel-gray, lustrous, hard, metallic, and takes a high polish. Its compounds are toxic. It is found as chromite ore. Siberian red lead (crocoite, PrCrO4) is a chromium ore prized as a red pigment for oil paints. Emerald is a form of beryl (a beryllium aluminium silicate) which is green because of the inclusion of a little chromium into the beryl crytal lattice in place of some of the aluminium ions. Similarly, traces of chromium incorporated into the crystal lattice of corundum (crystalline aluminium oxide, Al2O3) as a replacement for some of the Al3+ ions results in another highly coloured gem stone, in this case the red ruby. Cartoon by Nick D Kim ([Science and Ink], used by permission). 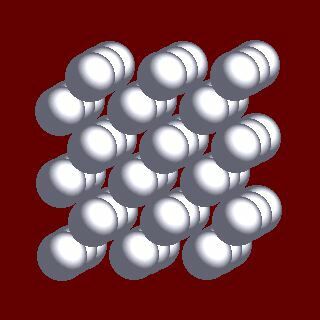 The solid state structure of chromium is: bcc (body-centred cubic). Chromium is an essential trace element and has a role in glucose metabolism. It seems to have an effect in the action of insulin. In anything other than trace amounts, chromium compounds should be regarded as highly toxic. Reactions of chromium as the element with air, water, halogens, acids, and bases where known. Binary compounds with halogens (known as halides), oxygen (known as oxides), hydrogen (known as hydrides), and other compounds of chromium where known. Bond strengths; lattice energies of chromium halides, hydrides, oxides (where known); and reduction potentials where known. Chromium was discovered by Louis-Nicholas Vauquelin in 1797 at France. Origin of name: from the Greek word "chroma" meaning "colour", named for the many coloured compounds known for chromium.. 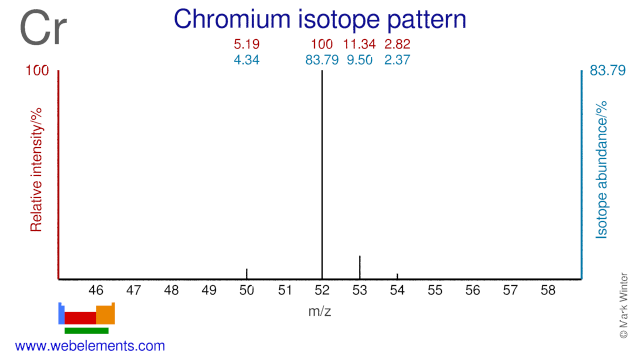 Isotope abundances of chromium with the most intense signal set to 100%. Isolation: it is not normally necessary to make chromium in the laboratory as it is so readily available commercially. The most useful source of chromium commercially is the ore chromite, FeCr2O4. 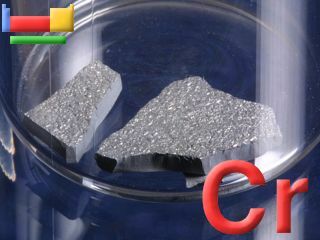 Oxidation of this ore by air in molten alkali gives sodium chromate, Na2CrO4 in which the chromium is in the +6 oxidation state. This is converted to the Cr(III) oxide Cr2O3 by extraction into water, precipitation, and reduction with carbon. The oxide is then further reduced with aluminium or silicon to form chromium metal. Another kind of isolation is by electroplating processes. This involves the dissolution of Cr2O3 in sulphuric acid to give an electrolyte used for chromium electroplating.